This past Sunday, after preaching a rousing sermon of giving thanks for your blessings, Central Baptist International Church Pastor Karl Hodges accepted a three hundred dollar check from the Royal Vagabonds Club for the CBIC Youth Department. Formed in 1928 and incorporated in 1948, as a social and civic organization, the Royal Vagabond club was organized by professional men in the community with the desire to have a positive presence in the community for Blacks during the years of Jim Crow and segregation. Now numbering close to twenty members, the Vagabonds vow to continue to make a difference in the community and the lives of people of color. 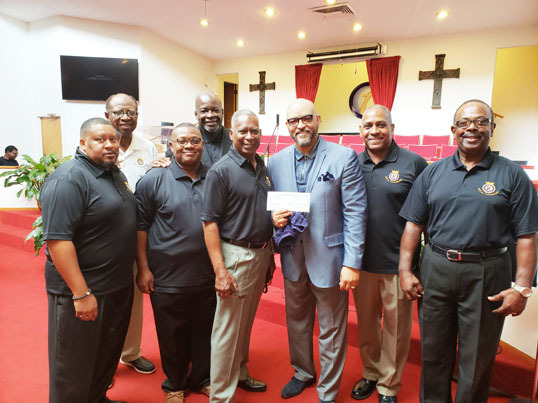 Shown accepting donations (l-r), Desmond Meek and Tony Hill; Karen Britt and Rep Tracie Davis; CBIC Pastor Karl Hodges with Royal Vagabond members (l-r): Bernie Cooper, Lou Myers, Danny Larkins, Seabon Dixon, Lavale Paulin, Pastor Karl Hodges David Phillips and President Ronald Render.